'Despite Spielberg's noble intentions, The Post never rises to the level of All The President's Men,' observes Aseem Chhabra. Before Edward Snowden and Julian Assange, there was Daniel Ellsberg, a former United States military analyst, who in 1971 leaked thousands of pages of a secret government report first to The New York Times and then to The Washington Post, and several other newspapers. The report that Ellsberg leaked -- better known as the Pentagon Papers -- essentially said that US governments under Presidents John F Kennedy, Lyndon B Johnson and Richard M Nixon lied to the American public and continued to fight an unwinnable war in Vietnam. Steven Spielberg's latest film The Post salutes Ellsberg -- the film begins with him experiencing the Vietnam war first hand, before he speaks his mind to then US secretary of defence Robert McNamara, that America was losing the South East Asian conflict. But most of The Post is a tribute to the publisher and the editors of The Washington Post grappling with the moral, ethical and legal issues whether the leaked documents should be shared with their readers. And while The Post is set in 1971, it is equally relevant today as it speaks out for the cause of the freedom of press -- in the US and in every country where powerful politicians often try to suppress news stories that reveal uncomfortable truths about them. Spielberg's film is also an important reminder to media houses, and their owners that there once were strong willed publishers like Katherine Graham of The Washington Post who were willing to risk the future of their newspapers just to get the truth out. And they did not cower down to pressures and threats from businesses, governments, and popular politicians. Meryl Streep working for the first time with Spielberg, plays the feisty Graham who inherited The Washington Post along with other related media businesses after her husband Philip Graham committed suicide. She was 45 at that time. In 1971 Streep's Graham is 54 -- 14 years younger than the actress' current age. But age has never been a factor or challenge for Streep who is very good in no matter what she does -- from her Oscar-winning heart wrenching performance as a Holocaust survivor in Sophie's Choice (1982) to acting in a critically panned, but a huge global hit musical Mamma Mia! (2008), which was inspired by ABBA's popular songs. No surprise that Streep is terrific here, as a strong-willed businesswoman -- usually the only woman in smoke-filled boardrooms packed with men -- who is also a caring mother, grandmother and a big socialite, hobnobbing with Washington, DC's powerful personalities, including her close friend Robert McNamara. 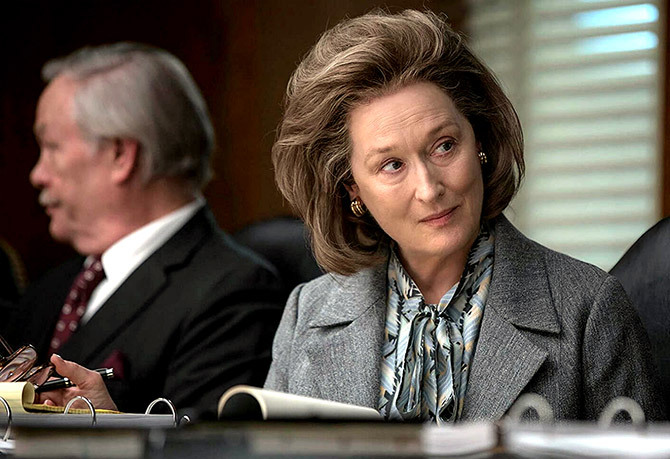 Tom Hanks (a Spielberg regular, working for the first time with Streep) plays Ben Bradlee, the executive editor of The Washington Post, who maintains a healthy relationship with Graham, seeks her counsel, but also fiercely guards the newspaper's editorial independence. Much of The Post has Bradlee and his editors trying to play catch-me-up with The Times, the first newspaper to leak the Pentagon Papers. The same day Bradlee's newspaper carries Richard Nixon's daughter's wedding photographs on the front page. Many of the film's scenes are set in The Washington Post's large editorial floor, with journalists assigned to desks, each with their own typewriter and rotary telephone. Or the film takes us in the newspaper's editorial boardrooms where Hanks' Bradlee often has his feet up on the table. I never met Bradlee, but an image of the charming, although tough talking editor has stayed with me since the first time I watched Alan J Pakula's 1976 political thriller All The President's Men, a masterpiece, based on the Pulitzer Prize-winning book, and the gold standard for all hard hitting journalism-based films. Jason Robards won the best supporting actor Oscar playing Bradlee in Pakula's film. While Hanks is good as Bradlee in The Post, his efforts are dwarfed because Robards has left such a strong impression having played the same role to perfection. In fact, watching The Post, I kept hoping to see Robert Redford's Bob Woodward and Dustin Hoffman's Carl Bernstein (the two leads in All The President's Men) to make surprise guest appearances in the Spielberg film. The Post is set in the pre-Watergate era. The epilogue of the film says so quite clearly. And more important -- despite Spielberg's noble intentions, The Post never rises to the level of All The President's Men. There are tense moments in The Post, but the film is not as tightly woven as Pakula's film, with terrifying scenes of simple cab rides in the dark of the night in Washington, DC and visits to underground parking lots. There is a bigger difference between the two films. In In All The President's Men Woodward and Bernstein's quest for the story always remains the focus and the two leads help push the narrative. But Spielberg is too much in love with his stars, especially with Streep. So often, the narrative is left on the side, as we watch Streep's Graham reflecting on her life, marriage and family, passion for the newspaper, thinking aloud, arguing with men -- all of them junior to her, and even being conflicted about her decisions. All of this makes for a good film, but not brilliant cinema.